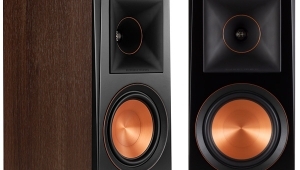 What kind of speaker can you get for $250/pair? 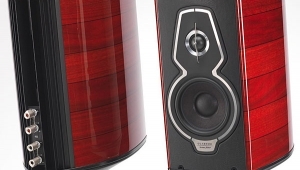 The most tightly contested sector of the speaker market in the UK is right around that price. If you want to be competitive in Old Blighty, you have to offer something pretty special in that range—and because the stakes are so high, the competition is fierce. Of course, when you're selling speakers for approximately $100 apiece, you're not going to make much profit unless you can eliminate every possible manufacturing inefficiency. 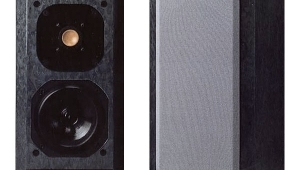 That's why most of the speakers competing for a market share in this range are made with automated milling machines—or, as in the case of the B&W DM302, injection molding equipment. 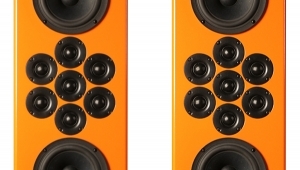 It's pretty obvious why this can lead to ease of manufacture, but, as the 302 demonstrates, it can also aid in controlling cabinet resonances and internal standing waves. "Well," I hear some audiophiles sneering, "that's what the manufacturer says, but that's just an excuse for making the speaker out of plastic." Perhaps there's some justification for such cynicism, but I'm not sure that, at $250/pair, buyers expect to have the same furniture quality that, say, Avalon customers demand. 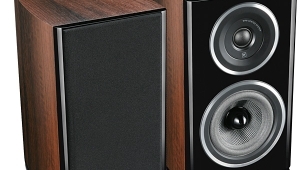 And there's no getting around it: The B&W DM302 sounds awfully refined and musical for a speaker that costs so little. 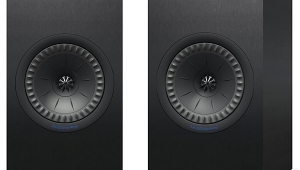 The B&W DM302 takes advantage of molding technology by casting the cabinet's front and rear baffles out of plastic. The front panel incorporates a wide slotted port, said to enhance low-turbulence venting. This, according to B&W, permits "complete freedom from audible port noise." Extensive cross-bracing, molded into the baffle, is also said to stiffen it and contribute to the 302's "remarkable absence of coloration." 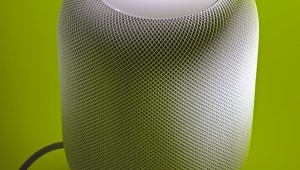 The rear baffle's inner surface is a complex configuration of randomly arrayed tapered pyramids, said to resemble the walls of an anechoic chamber. 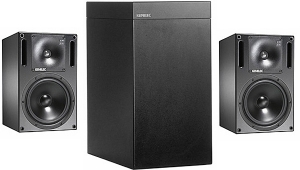 B&W calls this "Prism," and claims that it eliminates standing waves within the cabinet and enhances both bass definition and "speed." From the outside, this panel's honeycomb of rectangles looks like a waffle iron. 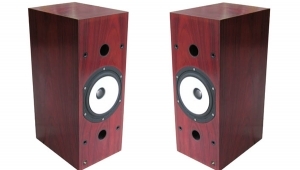 The DM302 uses a 1" soft-dome tweeter clamped internally to the front baffle. The faceplate has a tapering profile to reduce front-panel diffraction. The 5" bass-midrange driver employs a long-throw motor, a doped-paper cone, and a rigid steel chassis. The crossover point is 3kHz. The 302's five-way binding posts have plastic nuts, but can be tightened firmly onto a spade-lug if proper care is exercised. 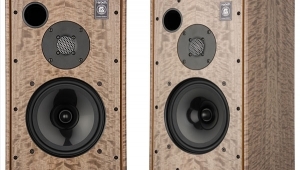 I found their position—inset into the "honeycombed" rear panel—awkward for my sausagelike fingers, but no more so than on many other speakers, including some hideously expensive ones. A bigger problem was that the posts are oversized and did not accept the small spades on my AudioQuest Dragon speaker cable. I feel strange complaining about this, since the larger spades are more common on better, more costly cables. But that's the point—I can't imagine that most people installing the 302s are going to use custom cables. Some Straight Wire banana plugs solved my problem. 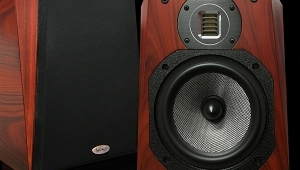 As with most small monitors, placement of the DM302s is everything if you want to make them sparkle. First, you have to compromise between bass extension and midrange clarity. For me, there's no contest—it's midrange clarity every time. I wound up with the speakers about 20" from the wall, about 6' apart, and angled in so that the front baffle was all I saw as I faced them. 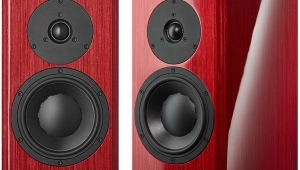 Having said that I had to compromise bass reinforcement to obtain greater midrange clarity, I must add that the DM302s sounded remarkably full-bodied for a speaker their size—amazingly full-bodied. Don't let the posey fool ya; these guys aren't wimps. 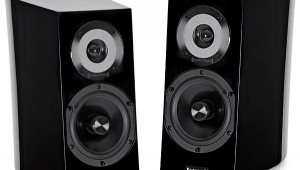 I once wrote what I thought was a rave review of a pair of compact monitors in which I felt duty-bound to report that, like all compact loudspeakers, they didn't play stupid-loud, and that they lacked a certain physical impact in the bass. 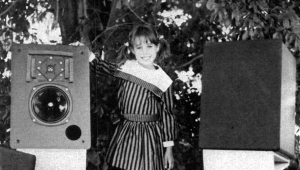 The US distributor reacted as though I'd told him his sister was ugly: "What do you expect from a small speaker?" he demanded. I guess he had a point, but I still feel I need to make some things clear. 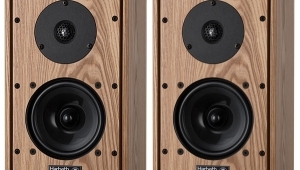 You wouldn't expect to reproduce organ-pedal tones at pants-fluttering levels from a speaker the size of the DM302, and, again, it doesn't. But when I perversely played Michael Murray's Bach at Zwolle anyway (Telarc CD-83085), I was stunned at how powerful and solid the organ sounded—it may have lacked impact in the bottommost octave and a half, but I was clearly listening to a magnificent instrument, and the 302s did a superb job of rendering the space in which Murray was playing: the St. Nicholas Church in Kampen.